The Football League Cup, commonly known as the League Cup or, from current sponsorship, the Carling Cup, is an English football competition. Like the FA Cup, it is played on a knockout (single elimination) basis. Unlike the FA Cup where 762 teams entered in 2008–09 only 92 clubs can enter—the 20 clubs of the Premier League, and the 72 clubs of The Football League, which organises the competition. Also unlike the FA Cup, the semi-finals are played over two legs. The winners qualify for the UEFA Europa League, if they have not qualified for European competition through the Premier League or by winning the FA Cup. If this occurs, then the Europa League berth goes to the highest-placed team from the Premier League not already qualified for Europe. Manchester United are the current holders. The League Cup is seen by some larger clubs as a lower priority than other competitions. Some clubs have made a point of fielding a weaker side in the competition, making the opportunity for giant-killing of the larger clubs more likely. Many of the top English sides, Arsenal and Manchester United in particular, have used the competition to give young players valuable big-game experience. The women's game has its own League Cup, which is open to the 36 women's clubs in the three divisions of the FA Women's Premier League. During the late 1950s, the majority of senior English clubs equipped their grounds with floodlights. This opened up the opportunity to exploit weekday evenings throughout the winter. The League Cup was introduced in the 1960–61 season specifically as a mid-week floodlit tournament. In the early years of the competition, many of the top teams declined to take part. It was only when automatic entry to the UEFA Cup was promised to the winners that the full League membership took part. In the last 10 years, following restructuring of European football, and the introduction of the restructured format of the UEFA Champions League, the League Cup was threatened with losing its UEFA Cup berth for its winners. It has retained it thus far however, and along with France is the only nation to offer a UEFA cup berth to its second cup competition winners. Therefore it retains enough importance and popularity, especially with fans of clubs for whom the League Cup offers a realistic chance of qualifying for Europe. Aston Villa were the inaugural winners in 1960–61. 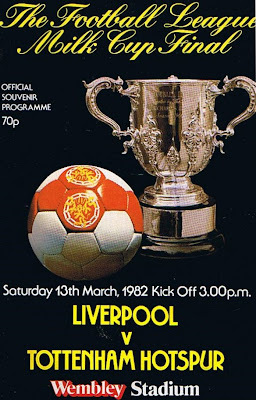 Liverpool have won the cup on the most occasions with seven victories including four successive trophies in the early 1980s. They have appeared ten times in the final overall, also a record. Thanks to winning the competition, Liverpool were able to complete two trebles of trophy wins, in 1984 and 2001. The present holders are Manchester United, who beat Aston Villa 2–1 in the 2010 final. Giant killings are less well remembered in the League Cup than the FA Cup due to the absence of non-league sides and the fact that many big clubs have fielded very under-strength sides when knocked out. However, there have been some notable upsets, such as Fourth Division side Chester knocking league champions Leeds United out 3–0 en route to the semi-finals in 1974–75. In 1995–96, Manchester United were beaten 3–0 at home by York City in the second round, first leg, United could only win 3–1 and went out 4–3 on aggregate. United have also been knocked out by Southend United and Coventry City in 2006–07 and 2007–08 respectively: in the match against Southend they fielded a strong side, bucking a trend they had themselves started. In 2001–02, holders Liverpool were defeated 2–1 at home by Grimsby Town. Grimsby recorded another giant killing in 2005 by knocking out Tottenham Hotspur. This is only used when the number of teams in European competition affects the number of byes to the third round and it would not be easier to give a club a bye to the second round. Matches involve the eligible clubs who finished lowest in the English football league system last season (normally clubs promoted from Conference National). This has only been used once—2002–03. The ties are single matches, with extra time and a penalty shootout if necessary, with the winners progressing to the next round. All clubs playing in The Football League (the Football League Championship, Football League One and Football League Two), unless they are competing in the UEFA Europa League, enter at this stage and join any Preliminary Round winners. Sometimes (depending on the number of clubs competing in Europe, whether or not they play in The Football League and whether a preliminary round would be an easier way to even up the numbers) it is necessary to give one or more clubs a bye to the second round. The clubs would be those eligible to compete in the First Round who finished highest in the English football league system last season (normally clubs relegated from the Premier League). For this round, the clubs are divided in northern and southern sections (though not always equally, so there could be more clubs in one section than another and, strangely, some of the clubs in the northern section are actually located further south than some of the southern section clubs). Half of the clubs from each section are seeded and half are not. First a draw is made to determine whether the seeded club is to play at home or away, and then the club is drawn against an unseeded club from their section. All clubs playing in the Premier League, unless they are competing in the UEFA Champions League or Europa League, as well as any clubs that may have been given a bye to this round, enter at this stage and join the First Round winners, although Manchester City were not exempt in 2008–09, having qualified for the UEFA Cup through the Fair Play league. All clubs competing in the UEFA Champions League or Europa League enter at this stage and join the Second Round winners (making for a total of 32 clubs). The winners of ties in the previous round play single matches, with extra time and a penalty shootout if necessary. The fifth round is also known as the quarter-finals. The four quarter-final winners compete in this round. The ties are played over two matches (one at each club's stadium), with the aggregate score being used to determine the winners. If the aggregate scores are level at the end of the 90 minutes, extra time is played. If the scores are still level at the end of extra time, the team which has scored more away goals goes through. If the number of away goals is still level, a penalty shootout is used to decide the winners. The two semi-final winners compete to win the cup. The tie is a single match played at a neutral stadium (which was the Millennium Stadium between the seasons 2000–01 and 2006–07 but returned to Wembley Stadium from 2008 onwards), with extra time and a penalty shootout if necessary. Since 1990, the best player in the League Cup final – as chosen by the Sky Sports television panel – has been presented with the Alan Hardaker trophy, named after the former secretary of The Football League who devised the Football League Cup. The trophy has never been won by any player more than once, and the current holder of the trophy is Manchester United's Antonio Valencia. The current League Cup trophy. Rather than the traditional medal, each member of a League Cup winning team receives a tankard. Most tournament wins (team): 7 wins, Liverpool. Most final appearances (team): 10, Liverpool. Most tournament wins (individual): 5, Ian Rush for Liverpool. Most final appearances: (individual): 6, Ian Rush for Liverpool (1981-4, 1987, 1995) and Emile Heskey for Leicester City (1997, 1999, 2000), Liverpool (2001, 2003) and Aston Villa (2010). Highest goalscorer (career): Geoff Hurst, Ian Rush 49 goals. Highest goalscorer (season): Clive Allen, for Tottenham Hotspur, 12 goals in 1986–87. Most goals scored in a match (individual): 6 goals, by Frankie Bunn for Oldham Athletic vs Scarborough, 25 October 1989. Biggest win: West Ham United 10–0 Bury, second round second leg, 25 October 1983 and Liverpool 10–0 Fulham, second round first leg, 23 September 1983. Youngest goalscorer in the final: Norman Whiteside, 17 years 324 days, for Manchester United vs Liverpool, 1983. Youngest captain in the final: Barry Venison, 20 years, 7 months 8 days, for Sunderland vs Norwich City, 1985. The BBC and Sky Sports are host broadcasters. From 2009-10 the BBC will show one leg of each semi-final and the final live, with Sky showing at least one match from every round live, including the final. Highlights are shown on BBC One and the BBC Sport website. In its early years, coverage of the competition was split between the BBC and ITV, though the final was usually on ITV (and was only shown as highlights until 1984). From 1988-89 to 2008-09, ITV were the only terrestrial broadcaster covering the competition. They showed it exclusively until 1996-97 when Sky began covering it, and gained the exclusive live rights to the final. In Australia, two matches from each round, the semi-finals and final are shown live on Fox Sports. In the U.S. and Canada, games are broadcast by Setanta Sports. In Africa, Super Sport telecast the matches while Ten Sports and Zee Sports cover the event in India and Pakistan. ^ "Alan Hardaker Trophy Winners". football-league.co.uk. The Football League. 18 July 2008. http://www.football-league.co.uk/page/AlanHardakerTrophyWinners/0,,10794~1354852,00.html. Retrieved 1 April 2009. ^ a b c d e "League Cup Records". Coors Brewers Ltd.. http://www.carlingcup.premiumtv.co.uk/page/AllTimeStats/0,,11995,00.html. Retrieved 1 February 2009. ^ Rollin, Glenda; Rollin, Jack (2008). Sky Sports Football Yearbook 2008–2009. Headline. p. 1027. ISBN 978-0-7553-1820-9. ^ Rollin, Glenda; Rollin, Jack (2008). Sky Sports Football Yearbook 2008–2009. Headline. p. 1028. ISBN 978-0-7553-1820-9. ^ "Ashley Chambers player profile". http://www.lcfc.com/page/ProfilesDetail/0,,10274~35218,00.html. Retrieved 21 February 2009. ^ a b Rollin, Glenda; Rollin, Jack (2008). Sky Sports Football Yearbook 2008–2009. Headline. p. 1030. ISBN 978-0-7553-1820-9.